A beautiful and cleverly crafted 3 piece cup created from metallic threads woven into a floral French Chantilly lace provides ample support and lift to create a glorious shape. The tantalising sheerness is accentuated with narrow twin straps and rose gold hardware detailing. 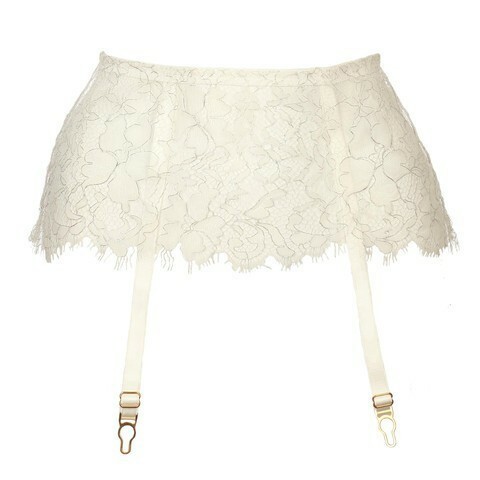 This beautifully sheer skirt style lace suspender nips in the waist and caresses the hips, with simple straps hidden underneath ending in rose gold exposed suspender ends for a hint of romance & style. Paired with stockings you can be sure to delight in this piece. Tease your admirer in this beautiful creation. Luxurious metallic embroidered French Chantilly lace featuring an eyelash scalloped waist with a rear V insert of lace framed in soft mesh to flatter your form create this hipster brief. Lace: 58% Polyamide, 42% Metal Polyester. Mesh: 71% Polyamide, 27% Elastane. Lining: 100% Polyamide. Exclusive of all trims.